Giant monsters. Giant robots. Giant monsters fighting giant robots. If the underlying principles of “Pacific Rim” sound familiar to you from Japanese anime, film, and television, don’t worry, you’re not alone. Mexican director Guillermo del Toro (Pan’s Labyrinth, Hellboy) favors the horror and science fiction genres. For his latest film, he specializes in spectacle. And he’s pulled out some of his favorite ideas from exactly the aforementioned. Pacific Rim’s main characters pilot “Jaegers,” giant robots the size of skyscrapers with an impressive, apparently endless array of weapons. The robots fight “Kaiju,” giant monsters emerging (as the film starts) one by one from a fissure deep beneath the ocean. The giant robot “mecha” traces its origins back to 1956, when Mitsuteru Yokoyama first published the manga “Tetsujin 28-gō,” detailing a robot operated remotely by a young boy. Go Nagai’s “Mazinger Z” manga, first published in 1972, made the decisive change of placing young pilots actually inside the giant robots, thus contrasting human youth and physical weakness with mechanical might. Both manga became successful anime series, and it’s been sky-high (and beyond, into deep space) for mecha ever since. Mecha have fought kaiju onscreen before, notably in 1973’s “Godzilla vs. Megalon,” which featured a giant robot called Jet Jaguar wrestling with Godzilla. But del Toro, armed with state-of-the-art CGI special effects, isn’t stopping at one or two robots, monsters, or fights. The film begins partway thorough a long, costly, demoralizing battle against the kaiju, which has united the entire Earth against the monsters, but has depleted resources, killed millions, and left the remaining population in jeopardy. Stacker Pentecost, played by English actor Idris Elba, leads a rear-guard action as the Jaeger program winds down. Pentecost seeks out Raleigh Beckett (played by Charlie Hunnam), a former Jaeger pilot who suffered the loss of his brother, and copilot, in combat. (Jaegers require two pilots to operate, a feature seen in some mecha anime, for example 2006’s “Zegapain.”) He wants Raleigh back in the mecha saddle, but picking a new copilot proves difficult. The most obvious match is Pentecost’s underling Mako Mori (Rinko Kikuchi). She scores highly on all the tests, and shows a rapport with Raleigh. But Pentecost is reluctant to put her into combat, for his own private reasons. Then, some disturbing news about the kaiju forces his hand, and “Pacific Rim” heats up. The obligatory combat sequences obligingly carry on long and thunderous, with nods to the source material such as seafaring craft tossed around like bathtub toys, and a certain bobble to the long-necked kaiju, a nod to the days when they were stuntmen in suits. The mecha, which after all have a stronger tradition in anime than in live-action fare, move more fluidly. 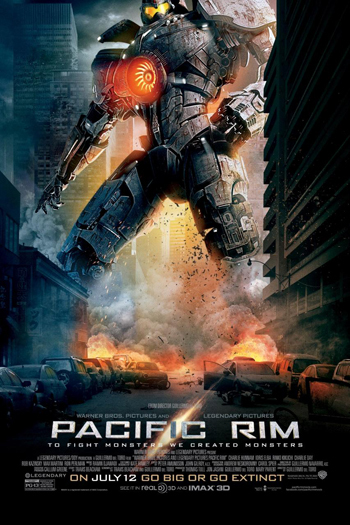 “Pacific Rim” opens Friday, July 12 at various theatres. Check local listings for venues, showtimes, prices, and parking.